Sustainable Sanitation for All: Experiences, challenges, and innovations, June 2016. Practical Action. Great strides have been made in improving sanitation in many developing countries. Yet, 2.4 billion people worldwide still lack access to adequate sanitation facilities and the poorest and most vulnerable members of society are often not reached and their specific needs are not met. Moreover, sustainability is currently one of the key challenges in CLTS and wider WASH practice, subsuming issues such as behaviour change, equity and inclusion, physical sustainability and sanitation marketing, monitoring and verification, engagement of governments, NGOs and donors, particularly after open defecation free (ODF) status is reached, and more. Achievement of ODF status is now recognised as only the first stage in a long process of change and sanitation improvement, with new challenges emerging every step of the way, such as how to stimulate progress up the sanitation ladder, how to ensure the poorest and marginalised are reached, or how to maintain and embed behaviour change. There have been several useful studies on sustainability that have highlighted some of these different aspects as well as the complexities involved. This book develops these key themes by exploring current experience, practices, challenges, innovations and insights, as well as identifying a future research agenda and gaps in current knowledge. Describing the landscape of sustainability of CLTS and sanitation with reference to the Sustainable Development Goals (SDGs) and through examples from Africa and Asia, the book captures a range of experiences and innovations from a broad range of institutions and actors within the WASH sector, and attempts to make recommendations and practical suggestions for policy and practice for practitioners, funders, policy-makers and governments. 2015 and the Millennium Development Goals (MDGs) are behind us. The new global goals for sustainable development are expected to inspire and create a new determination for all of us. What has IRC learned during 2015 and how are we moving ahead in 2016? Although a lot has been achieved the world has fallen short on the MDG sanitation target, leaving 2.4 billion people without access to improved sanitation facilities. Globally, it is estimated that 82 per cent of the urban population now use improved sanitation facilities, compared with 51 per cent of the rural population. What is the case for urban sanitation? Rapid urbanisation in many parts of the developing world is putting increasing strain on the ability of municipalities to deliver critical services, such as water and sanitation. More than half the world’s population (54 per cent) live in urban areas. Urbanisation combined with the overall growth of the world’s population is projected to add another 2.5 billion people to the urban populations by 2050, with close to 90 percent of the increase concentrated in Asia and Africa. As a result, many developing countries will face numerous challenges in meeting the needs of their growing urban populations. In a number of regions such as sub-Saharan Africa, population growth has already outpaced gains in sanitation coverage in urban areas. Inclusive and equitable access to improved sanitation facilities is still far away. Inequalities between richest and poorest 20 per cent of the population are found in all regions but may vary according to the type and level of service. Inequalities hinder efforts to reduce poverty and to stimulate economic growth, resulting in a negative impact on society as a whole. Therefore, ideally, more should be done for the poor than the rich, allowing the gap to narrow and ultimately disappear over time. Access to improved sanitation facilities does not necessarily translate into environmentally safe practices as even appropriately captured human waste is often improperly stored, transported, or disposed. To date, global monitoring has focused primarily on the containment of human excreta, where a sanitation facility is considered to be improved if it hygienically separates human excreta from human contact. This is now considered to be grossly inadequate as it does not address the subsequent management of faecal waste along the entire sanitation service chain, from containment through emptying, transport, treatment, and reuse or disposal. The Bill and Melinda Gates Foundation (BMGF) states that over 2 billion people in urban areas use toilets connected to onsite septic tanks or latrine pits that are not safely emptied or that discharge raw sewage into open drains or surface waters. The challenge is to keep up with the growing urban population, to ensure equitable access to improved sanitation services, and to address the entire sanitation service chain. The AfricaSan4 conference (25-27 May) ended with a declaration defining the vision and aspirations of the African Ministers in charge of hygiene and sanitation. African ministers in charge of sanitation and hygiene under their umbrella body African Ministerial Council on Water (AMCOW) have expressed their commitment to achieve universal access to adequate and sustainable sanitation and hygiene services and eliminate open defecation by 2030. They reinforce their committment by promising to increase annually the sanitation and hygiene budget lines “to reach a minimum of 0.5% GDP by 2020”. This is contained in a declaration issued by the ministers at the closure of AfricaSan4 in Ngor, Dakar, Senegal. The declaration acknowledges that while 133 million people living in Africa have gained access to sanitation since 1990, over 500 million still lack access and many more still defecate in the open. The Ministers’ commitments address a wide range of issues that must be tackled to improve sanitation and hygiene including: political leadership; financing; monitoring and evaluation; equity and inclusion; research and learning among others. The Ministers also call upon all stakeholders to play different roles to achieve the vision. The commitments contained in the Ngor Declaration 2015, replace the eThekwini commitments of 2008. The CLTS Knowledge Hub at the Institute of Development Studies (IDS) is hosting an international work- and writeshop on CLTS and Sustainability from 6-12 April 2015 at Lukenya Getaway near Nairobi, Kenya. Participants’ writings, together with commissioned pieces of work will form the basis of a publication on sustainability that will published in the IDS series Frontiers of CLTS: Innovations and Insights. P.Bongartz@ids.ac.uk by 31st January 2015. If your application is successful, you will be invited to work on a first draft to be submitted by 13th March 2015. 2.6 billion people are waiting for a toilet and the faecal sludge of an additional 1.5 billion people never gets treated. In the face of these indeed formidable challenges, the sanitation sector seems to have forgotten to celebrate the growing sense that we are getting a grip on how to tackle the problem of non-sewered sanitation. A new IRC paper  is an invitation to everyone to contribute by commenting on the framework and by sharing lessons learnt. Sanitation is a public good and hence, national and local governments have a key responsibility to ensure that sanitation services that last are provided to all. The parameters for a sustainable sanitation service need to be built around access and use; operation and maintenance and safe faecal sludge management. The framework identifies political and individual commitment as a key condition for sustainable sanitation services. In addition, a sanitation service contains the following components: the enabling environment, the creation of demand, the supply chains, and well aligned financial arrangements and incentives. With increasing sanitation coverage, the focus of a sanitation service needs to shift from increasing access to and use of latrines (getting onto the sanitation ladder) to O&M and the safe disposal or productive uses of faecal sludge. The framework serves as a starting point for the development of a functioning sanitation service. However, the main argument of the framework is not towards a certain approach for demand creation or sanitation marketing but towards including and interlinking all four components and to consciously create political support for sanitation – creating a sustainable service that lasts. We welcome your feedback and comments to further improve the framework and we are especially keen on learning from you how different components of sanitation framework can and are being operationalized and interlinked. Most of all we want this framework to support the improvement of our collective impact so that the long wait for 1.6 billion can end. 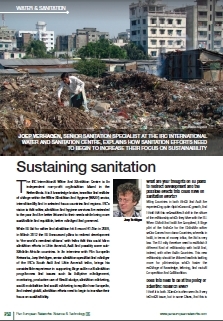 In an interview with Pan European Networks, IRC Senior Sanitation Specialist Joep Verhagen explains how sanitation efforts need to begin to increase their focus on sustainability. EU aid for water and sanitation hit a record €1.6bn in 2009, but in March 2012 the EU announced plans to redirect development to ‘the world’s neediest nations’ with fears that this could harm sanitation efforts in Latin America, Asia and possibly some sub-Saharan African countries. Joep Verhagen shares his thoughts on the EU plans and on how knowledge-sharing partnerships and research are helping to provide sustainable solutions to existing rural and urban sanitation problems. Sustaining sanitation is much more expensive than building latrines. The 20-year cost of sustaining a basic level sanitation service per person in certain countries is anywhere from 5-20 times the cost per person of building the latrine in the first place. This is one of the key findings on costing sustainable sanitation services, which are being highlighted in the first month of the WASHCost campaign. The campaign was launched on 24 October, and every month until March 2013, it brings a roundup of fast facts from the WASHCost research project, experiences from several organisations which are using the life-cycle cost approach and ways to get involved.